With the launch of the iPad looming ever closer, more and more developers are coming forward with plans for the device. The latest in line are book retailers Amazon and Barnes & Noble, both of which are hard at work on their respective e-book reading apps for the iPad, according to The New York Times. Neither of those companies were among the ones that got physical pre-production iPads to test their applications on and won't be aiming to make their applications available on launch day. Both apps will feature a completely redesigned interface to take advantage of the larger screen and likely some funky page-turn animations, because that's what we've come to expect from an e-reader. Given that Amazon has had an iPhone version of its Kindle app for a while and even recently released a beta version of its Mac client, it seems only logical that the software would head to the iPad. What’s more interesting, however, is whether or not the iPad app will allow customers to buy content from the Kindle Store. The New York Times says that both vendors are working on apps for reading and buying e-books—and the screenshot above does show a link for shopping in the Kindle Store—but it’s not clear whether that will open the bookstore within the app itself, à la Apple’s own iBooks app, or simply bring up the Web-based store in the iPad's browser, as Amazon's Kindle app for the iPhone does. 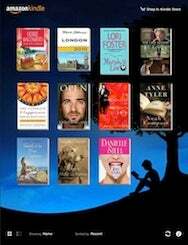 Some have speculated whether Apple would approve the Kindle app if it allowed customers to purchase books from inside the app. In my opinion, if Amazon wants to do it, there is no reason for Apple to stop them. Apple has always been more interested in selling the razors than the blades and the more content they allow onto the iPad—no matter which channel it comes from—the more appealing the iPad itself becomes for consumers. It’s also worth noting that Apple will not include the iBooks app pre-loaded on the iPad itself; instead, it will be available as a free download from the App Store. That ought to at least shield apps like the Kindle and Barnes & Noble e-readers from the infamous “duplicates existing functionality” rejection. It’ll be interesting to see how this situation unfolds.